Hello! I am u/porkpot, and welcome to the largest AI game I have yet to host! 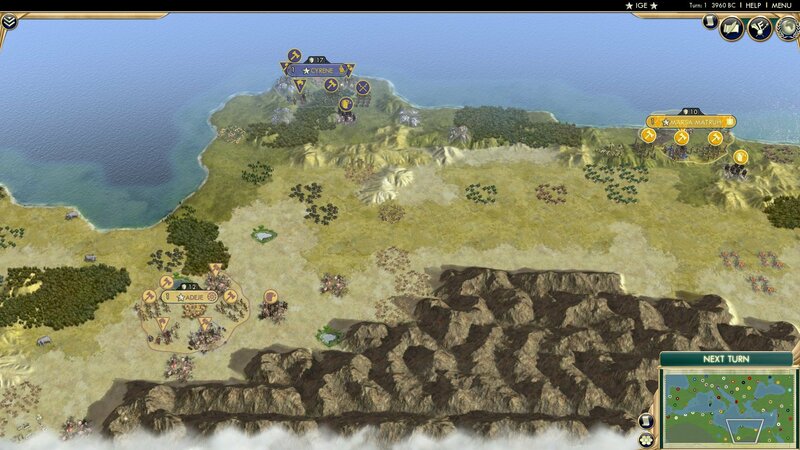 This game deals with a crowded Mediterranean region, 58 AIs battling it out to see who is the top. 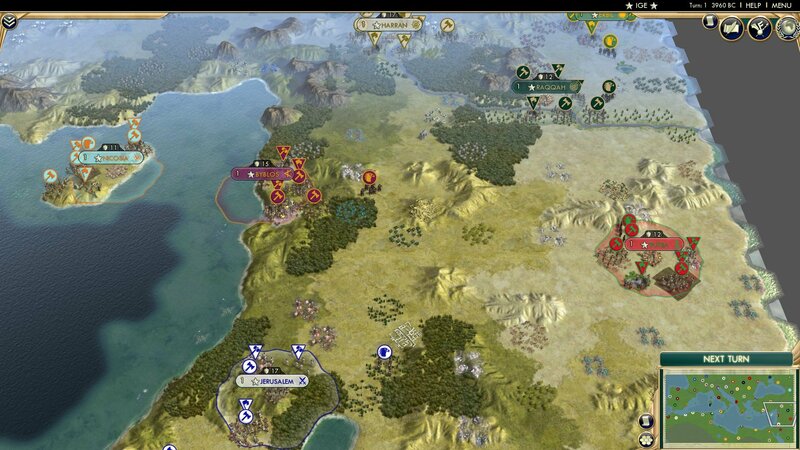 Expect quite a few Civ Battle Royale Mk. II contenders. Warning: This album contains a lot of writing. 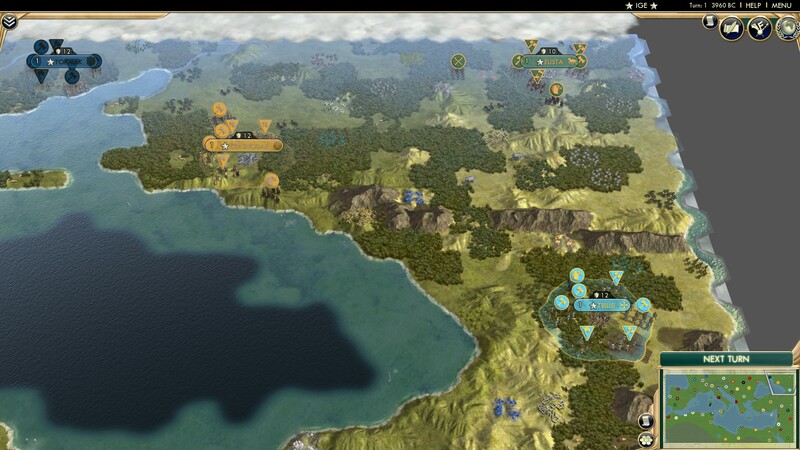 If you're not interested in knowing what every civ does, feel free to not read any of it. ALSO! For some reason, marshes give 4 food... I have no idea why. Anyway, here we go! To the north of our observation sub lie two nations. We'll start off with an easy one: everyone knows what Morocco does and what Ahmad al-Manslaughter is capable of, especially in the CBR Mk II. The only thing that's special about them is that they are the half-winners of AIberia, along with the Visigoths. The first appearance of the Umayyads (What??? They're in this twice? Yeah! I know!) is based in Taza. They're led by Al-Walid I. Military units may be disbanded for faith, and cities with religious units stationed in them have a chance at spawning a military unit based on that city's faith output. 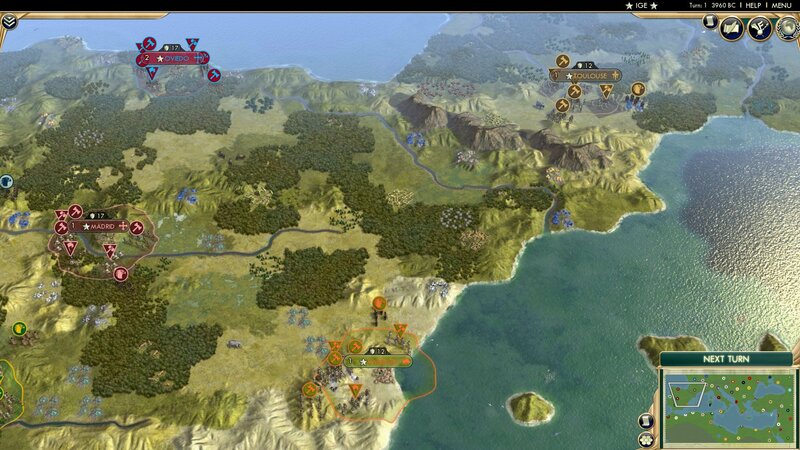 In southwestern Iberia reside 3 civs. Alfonso I of Portugal is based in Coimbra. Alfonso is a very religious leader, as defeating enemy units in their territory damage the enemy's cities and causes their citizens to flip to his religion. Courthouses also exude 25% more religious pressure. Nearby is Philip II of Spain in Madrid. His cities start with extra territory, apparently (could've fooled me), and are of his religion. During golden ages, his civilian units move an extra 2 spaces per turn. To the south in Córdoba is the Córdoban Caliphate, led by Abd-ar-Rahman III. Libraries, Markets, Amphitheaters and Workshops increase the yields of the Capital's Palace, and each religion in his city gives +2 culture and science. In northern Iberia lies Pelagius of Asturia, based in Oviedo. I would have included them in my AIberia game, but they weren't available yet. Anyway, they're also all about that faith: Conquered cities immediately convert to his religion, and faith is stolen for each convert. Though not relevant to this game, allied city-states join his empire when at war. Indibilis leads the Iberians in Valencia. Incoming trade routes give great artist points, and gifted military units generate culture and may return to him when he goes to war with their new owner. In Toulouse is Leovigild, leader of the Visigoths and the other half-winner of AIberia. He likes great artists and his base tourism generates production. In Tours is/was a familiar face for anyone who follows the CBR Mk. II, Napoleon. He gets great generals every time he goes to war, and can use them to instantly assimilate conquered cities. In Dijon is Philip III, leader of the Burgundians. City-states with positive relations with them give them cultural great people points and when creating a great work they get some gold as a bonus. In Luxembourg is Luxembourg (shocking, eh? ), led by Ermisinde II. Forts give money, citadels more, and for each friendly military unit that enters your borders, the nearest city gets its combat strength in gold. In Bern is Dufour of the Swiss Confederation. City-states won't declare war on him for no reason (not that they'll do that anyway), and for each person he isn't at war with, denouncing/denounced by, or friends with, he get 10% of their gold income. In northern Italy, the Lombards under Liutprand are based in Milan. Annexed, non-occupied cities in the empire with the same Religion as the Capital yield +15% more Great People and +15% more Production towards military units. Venice is also in this game, though it is modded. It can't build setters, but can get them from other means. They also get +1 Gold from Trading Posts, Fishing Boats, and Customs Houses. They pay less for navy upkeep too. Munich is the capital of Bavaria, home of Ludwig II. If a wonder has a culture yield, it is added to the city during construction. Cities with a wonder get a free great musician slot. In Zagreb is Croatia, led by Tomislav I. All maritime buildings don't have an upkeep cost, all coastal cities get a free lighthouse, and once a harbour is built all coastal tiles give one gold. In Rome is Julius Caesar. He gets great general points from conquering cities and building wonders. With the defeat of enough enemy units, he can build Triumphs, which grant increased happiness and wonder production, but can only be built once per city. In Cagliari, Victor Emmanuel II leads the Kingdom of Sardinia-Piedmont. Tourism is added to production when building units, and seiged city-states may surrender without incurring a warmonger penalty. Which is useful in a game without city-states. 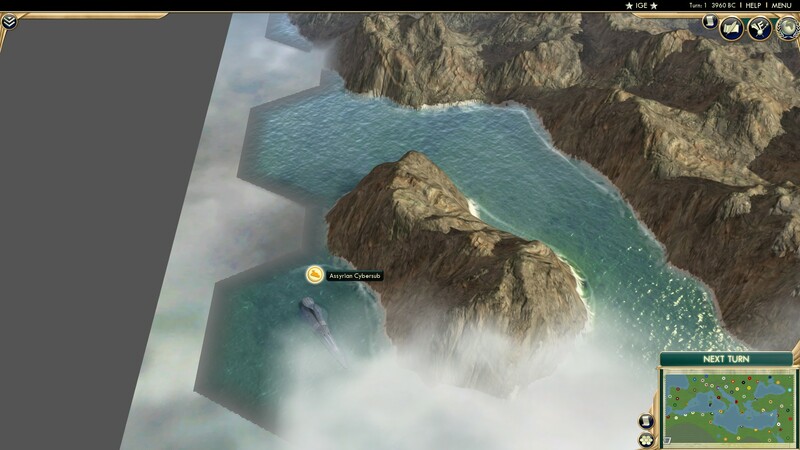 * All civs that start on islands have been given optics to get off of the island. How they use this is up to them. In Sarajevo is Tvrtko I's Bosnia/Bosniaks. If a missionary is in a city when a military unit is produced, it gets an extra 25% experience. Upon discovering theology, they get a free great general. They have previously won an AI game, u/Kaffe4200's (YA)AIM Italy. In Budapest is Stephen I's Hungary. Conquered cities slowly convert to their religion, and when the majority of your cities follow the same religion as your capital, 33% of their faith gain is added to golden age progress. In Belgrade is Serbia, led by Dusan. Workers ignore terrain cost, each completed policy tree grants +1 gold and production, and they get a free Kefalija when founding a city, which can improve mine resources. The Cuman(/Kipchak) empire led by Konchak is based in Cluj-Napoca. Garrisons in puppeted cities grant 2 tourism, and upon discovering tourism pastures yield 1 tourism and 3 XP for military units (max 2 tourism). Albania based in Tirana is led by Skanderbeg. Every city within minimum distance grants +100 land unit production, and upon entering the Medieval era all militaristic city-states are met. Any units produced become are converted to a friendly city-state's unique unit. Albania has won u/Kenny1997's Small Countries AI game. Another Battle Royale contender resides in Sparta, where Leonidas is always ready for Leg Day. After the first great general is earned, every time your capital grows you get a free infantry unit. 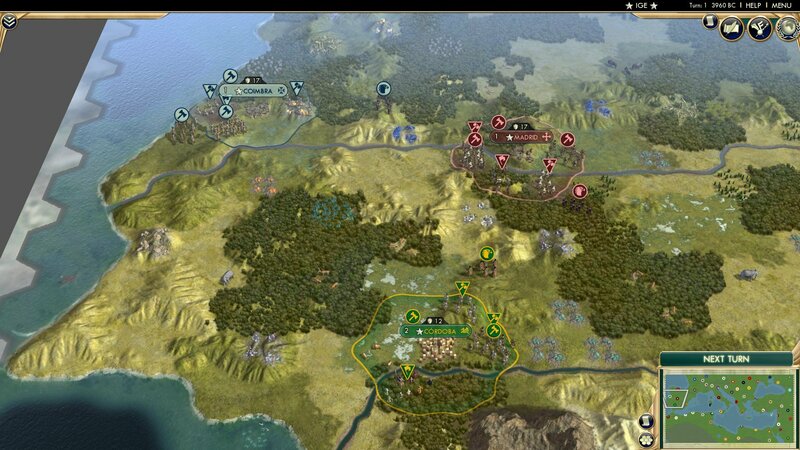 Conquering enemy cities has the possibility of causing your capital to grow. In Sofia is Simeon's Bulgaria. If a city has a forge, melee, archer, siege, and mounted units recieve a +25% bonus to defense against ranged attacks. All land units may attack and then move, and a free great writer is spawned upon researching Drama and Poetry. Hey look, another Battle Royale contender. Its Alexios I Komnenos, of Byzantium. 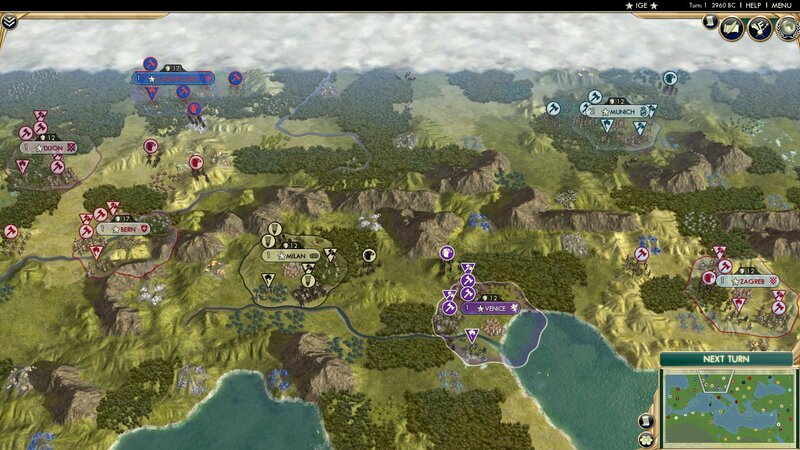 At the start of war, a golden age begins, and any garrisoned unit gains 100% strength. Mihai Viteazul leads Romania, centered in Bucharest. 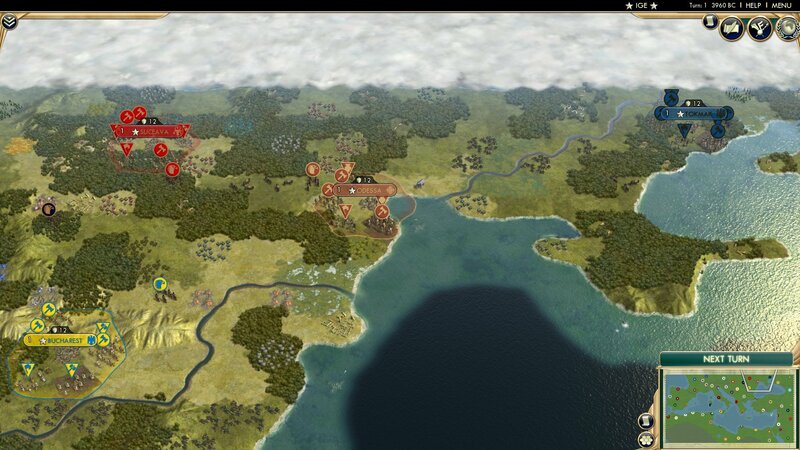 Golden ages generate 20% more culture, and you get a boost to your golden age upon capturing a city. If its a capital, you get a happiness boost too. Stephen III leads the Moldovans from Suceava. 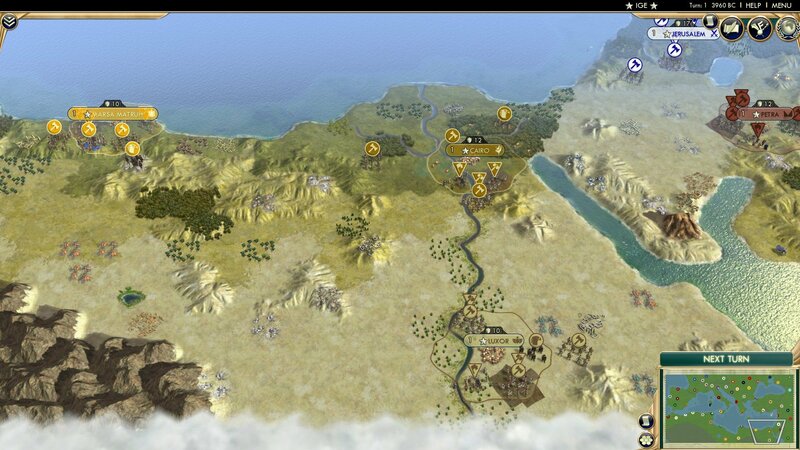 Each City increases the Gold they gain by 75 for each Great Person they expend, and they also recieve +30% Tourism from Great Works. In Odessa resides the Cucuteni-Trypillian culture, led by Venera. Their faith generation contributes to settler production, and shrines carry over 10% of food towards new citizens. In Tokmak is the Hetmanate, or Ukraine, led by Bohdan Khmelnytsky. 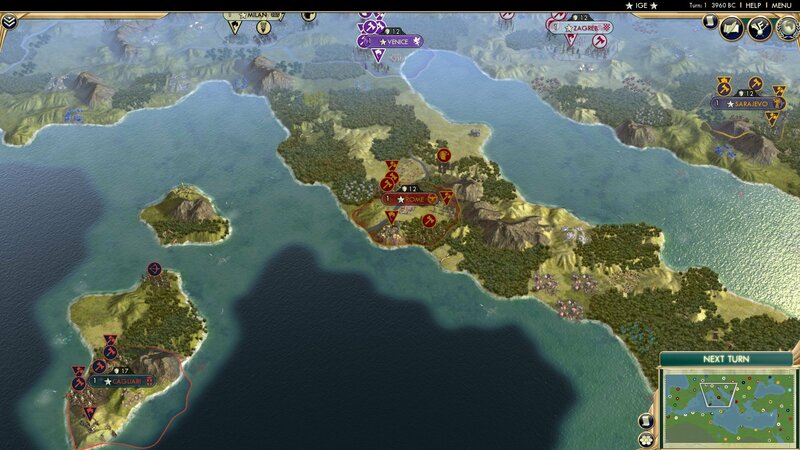 Pillaging enemy improvements gains food and great general points in cities. The Golden Horde is led by Tokhtamysh in Krasnodar. Their mounted units ignore enemy zone of control, and they gain influence from city-states they could demand tribute from. Elista is the home of Respendial's Alans. They can raze their own cities to gain a settler and a military unit for every 2 population that was born after that city was founded. If a city becomes a Point of Sedentism (can't be razed), cities settled away from that city receive production and happiness bonuses. Tamar leads Georgia, based in Tbilisi. Hills that have been improved and are located next to a city provide 1 faith, and if a city is adjacent to a mountain it gets +50% food for each different local bonus resource. In Hattusha is the Hittites, led by Suppliuliumas I. Their military units are 20% more effective at intimidating city-states, and other civs suffer increased influence decay with city-states they can demand tribute from. The Umayyads make their second appearance (Shouldn't be too hard to tell them apart) under Abd al-Malik in Harran. City connections yield 3 gold, and 1 production per city is equally divided amongst all cities that follow your religion. In Erbil are the Kurds, led by Barzanji. For every great person born in a city, that city generates an extra 1 culture. Units in enemy territory generate Golden Age points in exchange for taking damage. In Antalya is Ataturk's Turkey. If another civ has adopted a policy that you then adopt, you gain science. Also, promoting units prior to the industrial era provides faith, and after the industrial era provides culture. Cyprus holds the Cypriots, led by Peter I. During the Medieval and Renaissance eras, all Melee units gain the coastal raiders promotion, and 15% Gold in conquered Coastal cities. The Phoenicians are based in Byblos, and are led by Hiram. A free great merchant replacement appears after researching writing, and for each 1 science that is sent out via trade route Hiram earns 5 gold. Everyone's favourite vanilla Arabia leader Harun al-Rashid makes an appearance to lead the Abbasids from Raqqah. Themeing bonuses also grant them science, and each great work of writing they create grants them a copy for future use. Faisal I leads Iraq, based in Rutba. Cities settled on rivers gain +1 happiness and have a chance to improve flat, freshwater tiles with farms within 2 tiles. During golden ages river tiles provide +1 Faith. For some reason, a swords-waving Israel led by Ben-Gurion is based in Jerusalem (weird how their icon isn't the Star of David). They can occasionally receive gifted non-great person units from foreign cities that follow their religion. It is possible to receive any unit upon entering the industrial era. In Petra resides the Nabataeans, led by Areras III. They can spend gold to permanently increase a city's food yield. The Rashidun led by Umar call Tabuk their home. 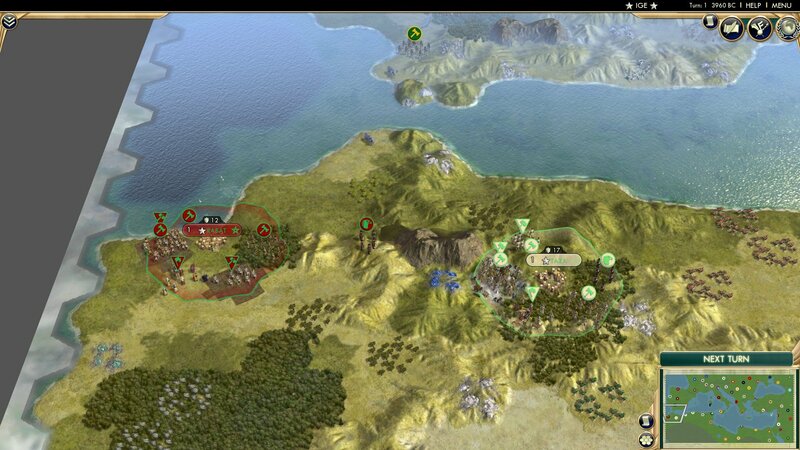 They get +5 faith per holy city, and their faith output is the starting production value towards all land units. Djoser leads the Egyptians from Cairo. All wonder production bonuses apply half of their bonus towards building buildings. Free great engineer replacement upon researching masonry. The Nubians under Piye are based in Luxor. Each world wonder in the empire increases the length of golden ages by 10%, and conquering a city with a world wonder starts a golden age. Cities with a ranged garrison unit gain 10% production. Creators of the Party Pope of the CBR Mk II are the Ayyubids, led by Saladin and based in Marsa Matruh. They receive free mounted units whenever a great prophet is born, and those units require no upkeep or horses and earn faith from kills. If they conquer a city, it'll immediately convert to their religion. 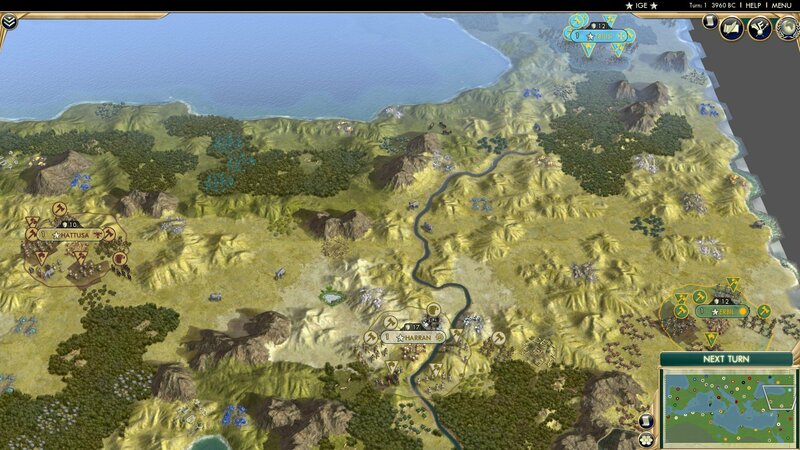 Ptolemy I leads, unsurprisingly, the Ptolemies in Cyrene. 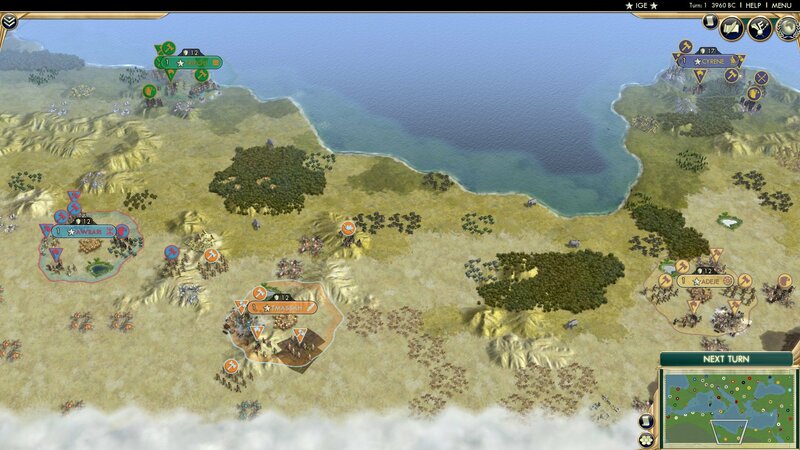 Gain one population upon building a world wonder, and great generals can be used to rush production. Djalla leads the Garamantes, who are based in Tmassah. 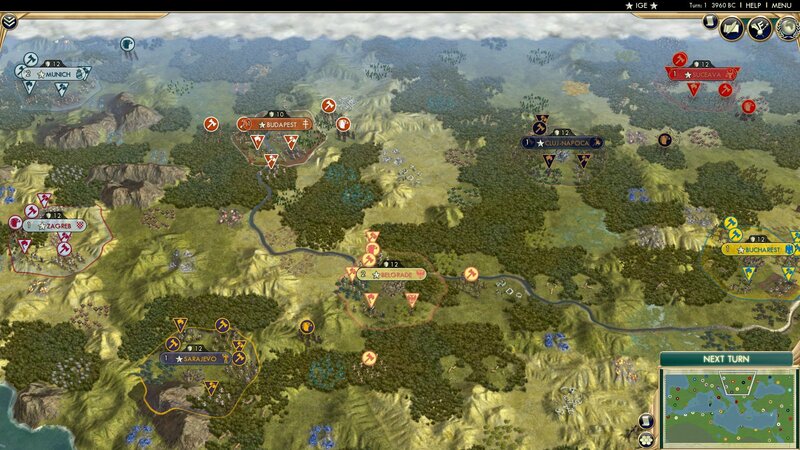 Units ignore terrain cost when moving with land trade routes connected to your empire and start with an extra movement if they start their turn on a trade route. Cities can spread the effect of their UI, the Foggara (oases on desert hills) to adjacent tiles. Jump to the recent past with Gaddafi's Libya based in Tripoli. All imported strategic resource provides culture and 1 local happiness when worked. Gold gifts to city-states provide 20% extra influence for every 5 social policies or ideological tenets selected. 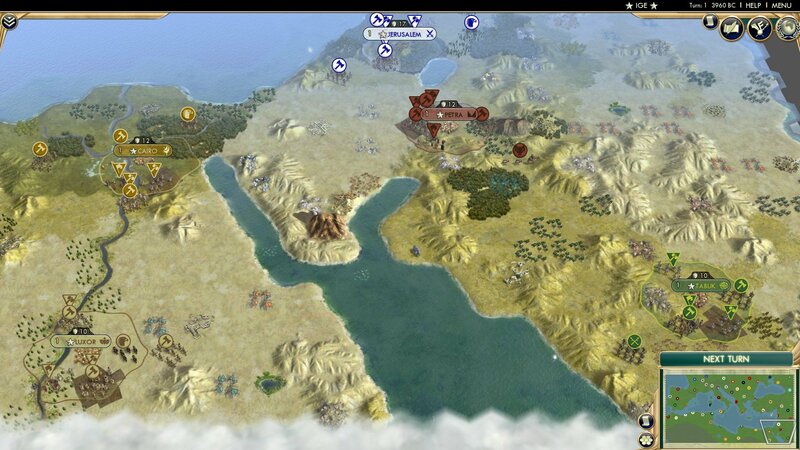 The Vandals under Genseric are based in Gades, as Hippo Regius is too close to Carthage to be feasible. 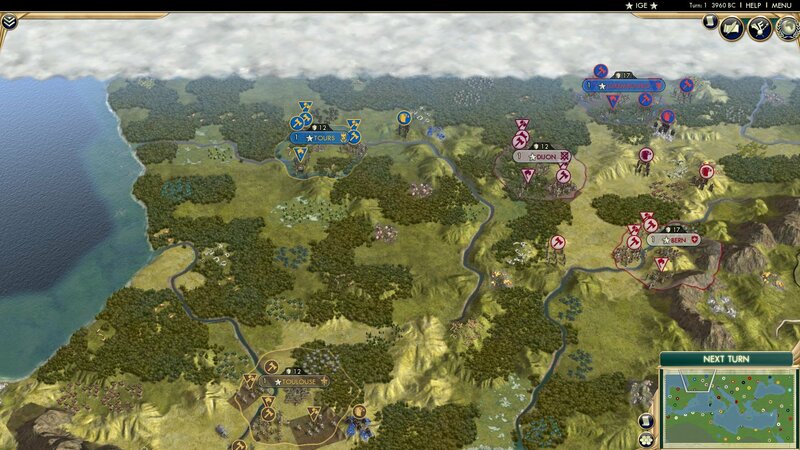 Their melee units receive a sizeable bonus against cities and gain gold from attacking them. They can also instantly raze coastal cities. 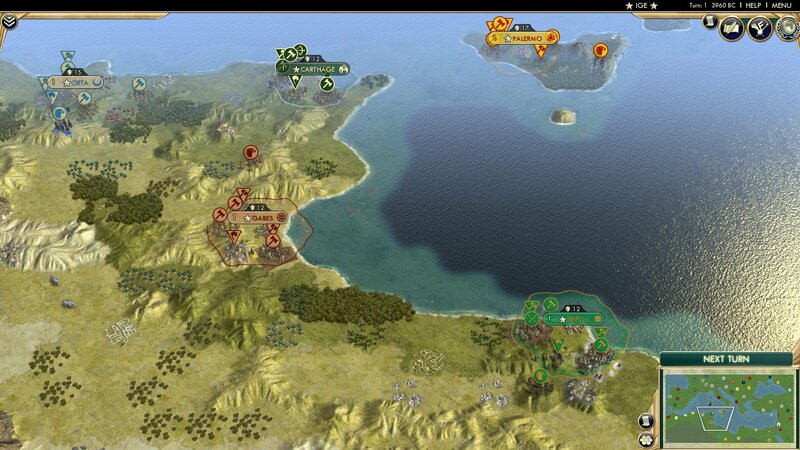 Hannibal's Carthage is/was another Civ Battle Royale contender. When at peace, garrisoned military units increase production, and units can cross mountains after the first great general replacement is earned. In Palermo are the Sicilians, led by Roger II. They get extra money and culture for each religion in the city that an international trade route ends at. 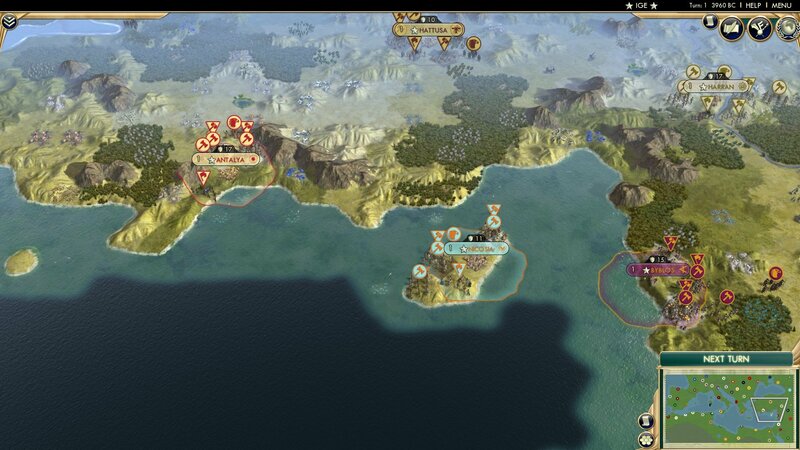 Coastal cities also yield an extra gold, and conquered coastal cities yield an extra 2. 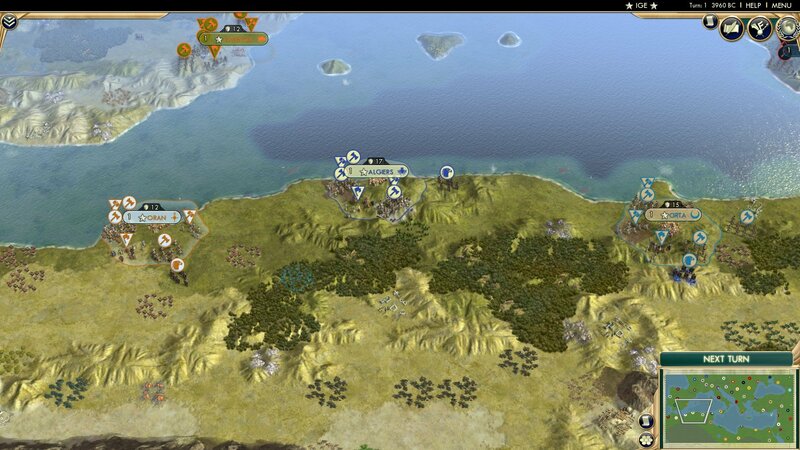 To the west of Carthage lies Numidia, led by Massinissa. If a city they have founded is conquered, it remains at 0hp until it is reconquered by them. 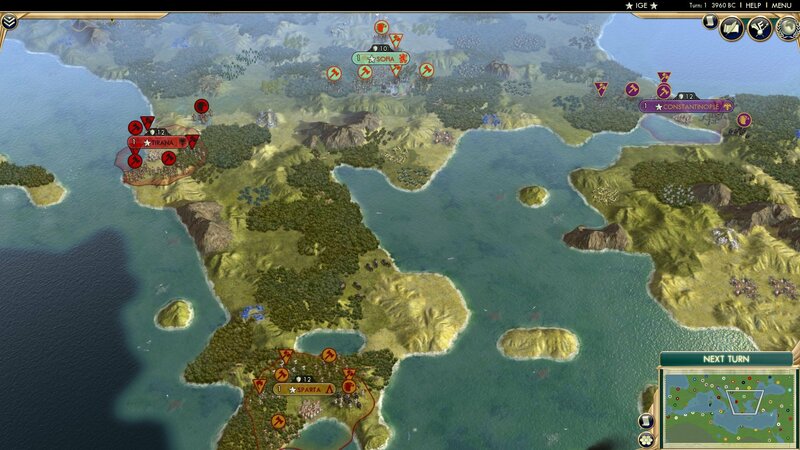 While at war, improvements in enemy territory have a chance of being pillaged each turn. Abdelkader el Djezeiri rules the Algerians from Algiers. Their faith output grants their cities extra defensive combat strength, and strategic resources on desert tiles provide double quantity. The Tuareg led by Tin Hinan are based in Oran. Each salt resource they have is worth an extra 2 gold. If a military unit is wounded and on friendly desert, they have a small chance of discovering a Wadi, which will dry up to become a source of salt.